This is not a review of, "Red Dead Redemption 2." I am by no means far enough into the game to offer a general overview of everything, especially because this is a game that is so full of content that it slowly unveils you could be hours in and still learning something new. No, instead I'll just break down three ways that I can already conclude the game is a masterpiece. This may be one of the most absolutely gorgeous games ever. Just simply spending chunks of time riding your horse up into snowy mountains, along winding plains, and into muddy swamps inspires awe. Animals appear flying and/or running around for you to track and hunt, or simply study. It feels like you're in this majestic world full of living, breathing characters all going about their business in bustling towns, or setting-up tents for the night in the wilderness. It is utterly awe-inspiring. The story itself has a unique beauty as well, dropping much of the usual cynicism and snark found in titles produced by Rockstar Games (look at the parody-styled take on America in the, "Grand Theft Auto," series for abundant examples), instead telling a story about the myth of the American West, masculine toxicity, and regret, lots and lots of regret. 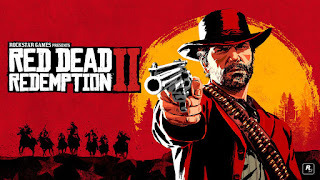 A prequel to the first game, "Red Dead Redemption 2," opens in 1899 as your main character, Arthur Morgan, and his team are on the run due to a botched heist. Bandits who live off the land and pride themselves on being free of the constraints of an increasingly-modernized America, the game follows your crew as things just seem to get worse. The good old days of the West are often discussed, yet many of the older characters dismiss this idea as things having always been the same, despite the rosy-lens folk like to view the past through. It's a depressing and stark story, miles away from the non-stop dirty jokes and sarcasm of the aforementioned, "Grand Theft Auto," games, with its own depressing beauty in how the epic tale methodically tells itself. A lot of today's new and modern games seem to want to overwhelm the player with options. Everything feels rushed as a player is told to do this main mission, accomplish a side-mission, gather all the rare trinkets marked on the increasingly-cluttered HUD, the whole thing exhausting. "Red Dead Redemption 2," does not do this. It never holds your hand beyond when it gives you instructions on how to do things, then leaves you to it. 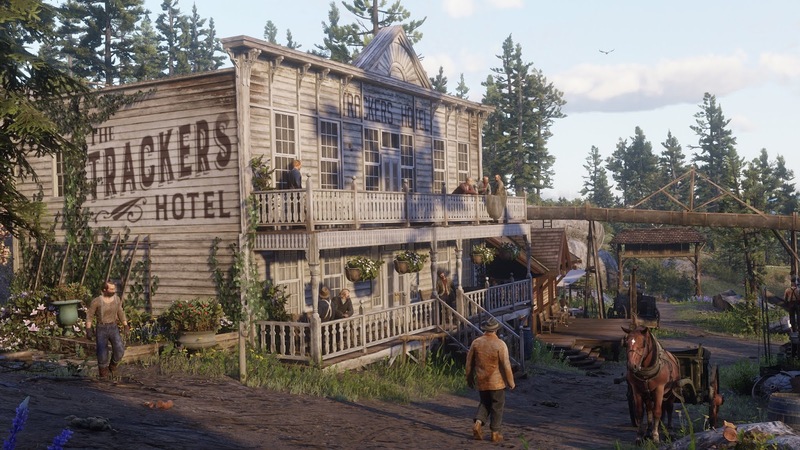 You can go hunting, look for herbs, mill about town greeting folk in-between some hands of poker at the saloon, and while there is a checklist of tasks for full game completion, it never feels forced. "Red Dead Redemption 2," doesn't want players to rush through the main storyline, it wants you to take your time doing the main tasks for your crew and in-between the bouts of action let yourself relax, explore, and otherwise take things slowly. When I hear people talking about the game/read comments online it isn't usually the big missions that are discussed, but the small seemingly random moments the game can suddenly surprise players with. That time you were riding your horse down main-street and a man was thrown out a window in an apparent brawl. When you tried to stop and assist someone with a wildly-bucking horse but before you could do anything the animal kicked its owner dead with a hoof-to-the-head and took-off, leaving you to debate the lack of honor in looting a dead man (I mean, he isn't going to be using his supplies anytime soon now). The world is utterly massive yet it is the small moments that seem to impart the most gravitas. There has been a lot of controversy over the work conditions at Rockstar Games. Apparently as the game neared its end of development employees were expected to engage in, "Crunch," where they could work up to 100-hour weeks with no expectation of overtime pay beyond hopefully big bonuses now that the game is a mega-hit. Talk of this seemingly-mandatory crunch along with the recent implosion of Telltale games sparked further discussion of how game-makers should be able to unionize and have some kind of protection. Even putting aside the behind-the-scenes drama, the game itself is not without its own troubling flaws. Mega-bugs that one would've expected to be noticed persist, and some individuals have found the slow pace and minimalist nature of the game off-putting in this era of games with constant action and hand-holding on maps loaded with symbols of all the content to do. 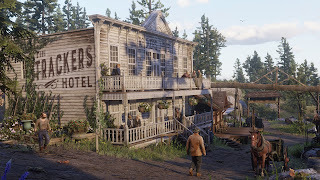 I've already said I love how, "Red Dead Redemption 2," doesn't force you into anything (after a relatively on-rails opening), instead letting random little things occur in the world that make it feel strangely alive...but then, when everything is so carefully constructed and perfected one notices how the tiniest cracks can seem massive. After all, you could shoot someone out in the wilderness and another person who seems far out of the line-of-sight will witness it and try to run to the law, yet if you stick-up a shop you will see how all the people milling around outside a few mere feet away--basically peering in the window--won't respond. 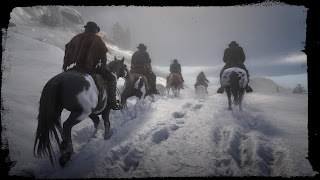 It isn't game-breaking, but when the company brags about how it paid so much attention to every detail that even horse testicles rise and fall in varying weather, you notice it. I am a sucker for looking-up spoilers in regards to games (and movies, books, etc.) 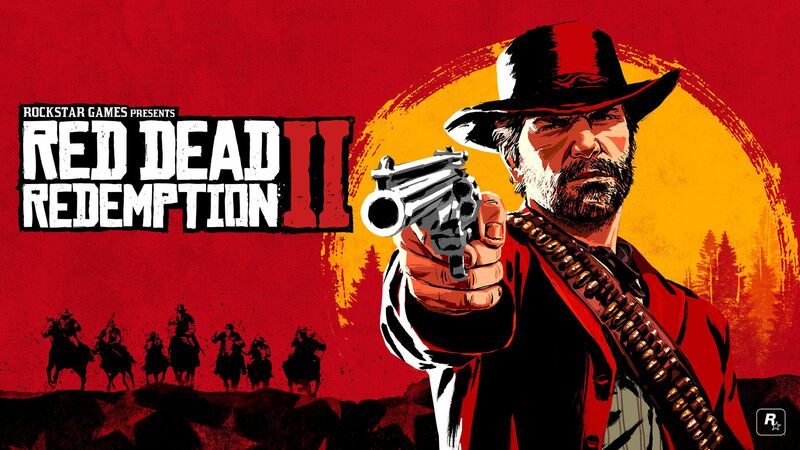 so I already have read-ahead to see how, "Red Dead Redemption 2," will proceed for my playtime and how it will conclude. 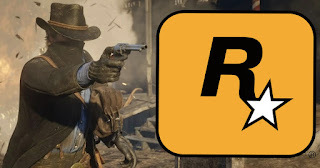 As odd as it may sound, now that I know how interesting things will continue to be when things sorta-end (don't worry, no spoilers, but as with many Rockstar games you can keep playing after the credits roll), it makes me all the more eager to keep going slowly and take my time getting to stuff even more impressive than what I've already seen. "Red Dead Redemption 2," is a masterpiece, from all its impressive elements to its problems. Plus, with a game so massive as this I think that another title I'm interested, "Cyberpunk 2077," might finally be released by the time I'm finished, so that's cool.